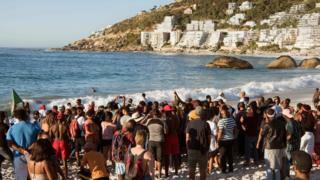 Protesters have taken to one of Cape Town's most picturesque beaches after private security guards were accused of ordering black visitors to leave. The guards, hired by local residents, allegedly cleared the Clifton 4th beach of tourists last Sunday evening. Cape Town Mayor Dan Plato said that the security firm "had no authority to ask anyone to leave Clifton beach". "We will not allow any private organisations to limit access to our public spaces," he said in a statement. Deputy Police Minister Bongani Mkongi vowed to "go hard on the security company". "This is a property of the state, property of the people and therefore we don't need security companies here," he said. Mayor Plato said that the guards had "asked people of all races to leave" and had not targeted black people specifically. "These private security guards... are actually briefed to not allow black people who appear to look like they are from the townships on to the beach," local activist Chumani Maxwele told the News 24 website. "It was absolute mayhem and [the police] were really doing a great job to stabilise the situation," he said.